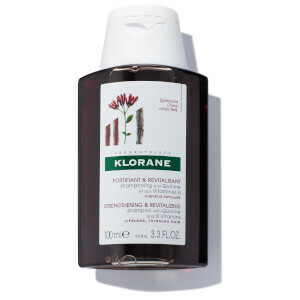 Formulated to help restore fine, noticeably thinning hair, the Quinine B6 Shampoo (200ml) by KLORANE will encourage hair growth and provide locks with a strong, nutritional boost. Gently cleansing your hair whilst detangling knots and enhancing volume, this fortifying hair treatment will leave hair looking fuller, thicker and healthier. Enriched with quinine, a bark extract from the cinchona tree, this anti-hair loss treatment helps to strengthen hair by stimulating weakened hair roots and improving skin microcirculation. A powerful complex of B vitamins simultaneously works to restore hair structure and promote growth. As a result, your hair will be left noticeably vitalized with improved strength and bounce. – N.P. Water (Aqua), Sodium Laureth Sulfate Cocamide DEA, Cocamidopropyl Betaine, Cinchona Succirubra Bark Extract (Cinchona Succirubra),Biotin, Blue 1 (Cl 42090), Butylparaben, DMDM Hydantoin, Ethylparaben, Fragrance (Parfum), Isobutylparaben, Methylparaben, Panthenol, Phenoxyethanol, Polyquaternium-22, Propylene Glycol, Propylparaben, Pyridoxine HCL, RED 33 (Cl 17200), Sodium Chloride, Triethanolamine, Yellow 10 (Cl 47005).